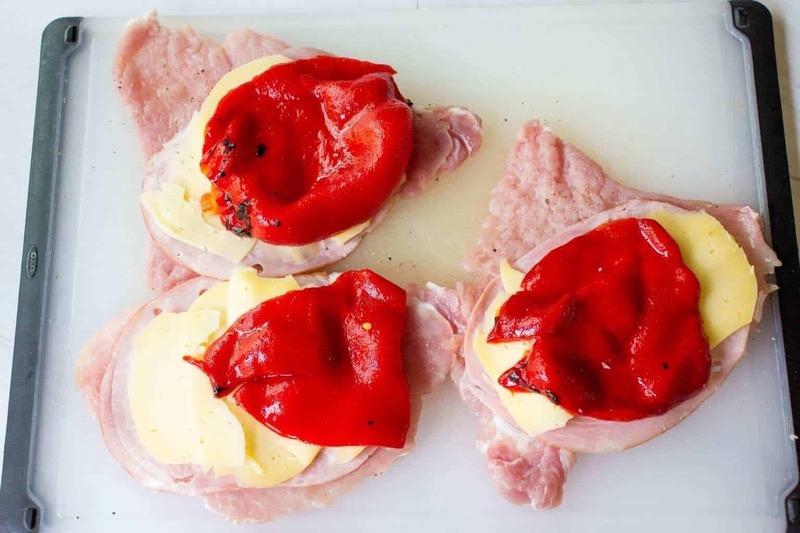 These comfort food at its best Spanish Style Pork Chops are crispy on the outside and stuffed with delicious combo of ham, roasted peppers and cheese. This recipe is a perfect way to turn regular pork chops into a scrumptious and satisfying dinner. As I continue to explore recipes of my favorite European countries, I couldn’t help but order a huge stack of used cookbooks from Amazon. And as I flipped through the pages of my newly purchased Spanish Cookbook, one particular recipe caught my attention. Spanish Style Pork Chops or Libritos de Lomo somewhat remind me of Ukrainian Chicken Kiev, that I made some time ago. You take pounded chicken breast or pork chop and stuff it with all kinds of delicious ingredients. Then it gets coated into a simple breading and cooked until crispy. So yummy! But unlike Chicken Kiev, that is traditionally stuffed with butter and herbs, Spanish Style Pork Chops use ham and cheese as their stuffing. I wanted to keep my recipe authentic as much as possible and picked up Spanish Mahón cheese over at Whole Foods. It melts nicely and has a great taste. If you can’t find Spanish cheese at your local grocery store, you can use the combination of Mozzarella and Gruyere. So, how to make stuffed pork chops? To feed 4 people, I use 2 pork chops. They were quite thick when I bought them, so I had to slice them in half. First thing you’re going to do is to take a rolling pin or meat tenderizer like this, place your pork chop in between 2 layers of plastic wrap and pound until it’s about 1/4 inch thick. Season with salt and pepper on both sides. 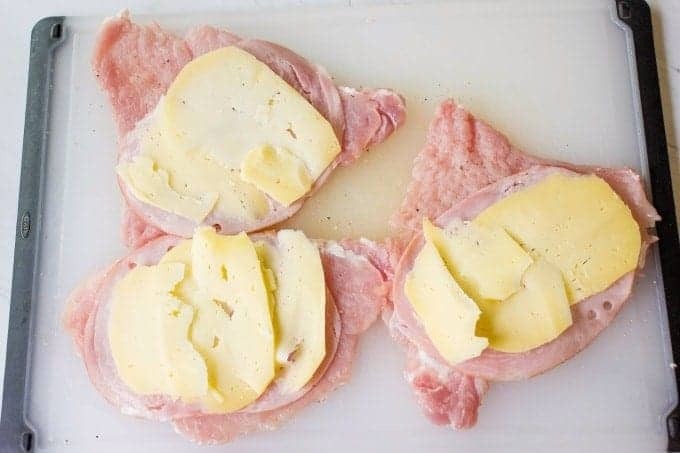 Next, place one slice of ham on top of each pork cutlet followed by a few thin slices of cheese. Spanish use special types of peppers in this recipe – Piquillo Peppers. Not all groceries sell them so I went with the regular roasted bell peppers in a jar. Place a slice of roasted bell pepper on top of cheese. If peppers are too big, you can cut them so they were smaller or the same size of pork cutlet. 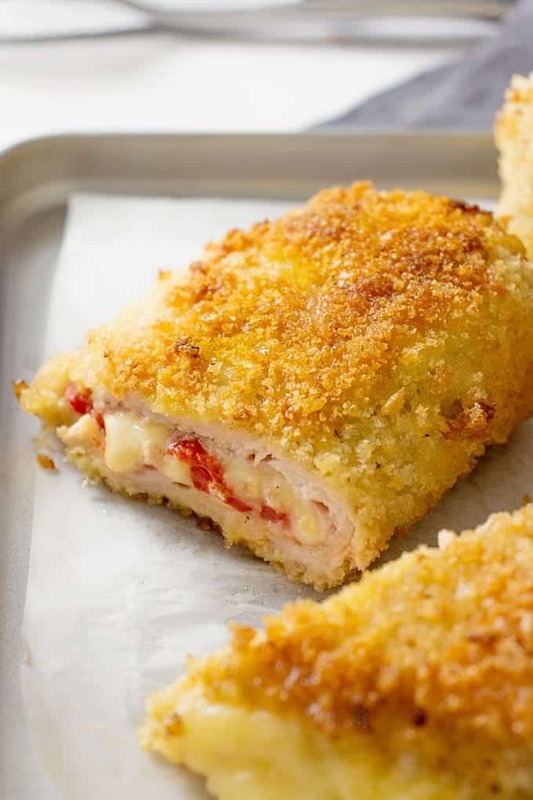 Carefully fold the cutlets in half, enclosing the filling. You can secure the exposed part with the toothpicks. Now, prepare the breading. Whisk 2 eggs in one shallow bowl. In another bowl add 1/2 cup of flour and in a 3rd bowl add 2 cups of Panko breadcrumbs. 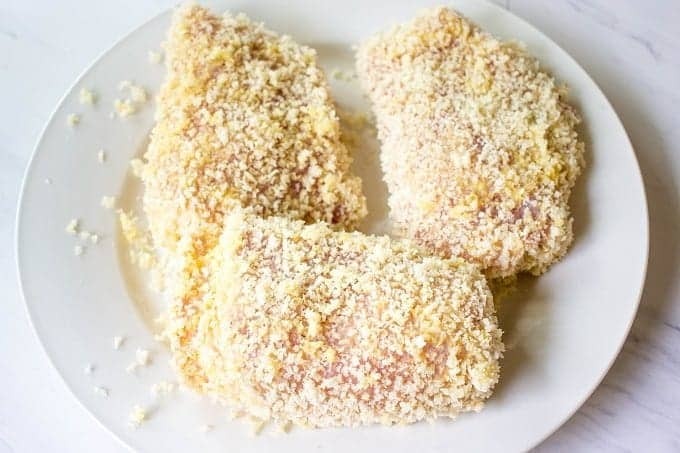 Dip each stuffed pork chop in flour, then egg followed by breadcrumbs. Now all you have to do is sear Spanish Pork Chops for a few minutes until the breading is brown and crispy and then finish them in the oven. How long do I bake stuffed pork chops? I baked them for 25 minutes at 400 F. I also recommend you to use instant meat thermometer for precise cooking time and take pork chops out the oven when the internal temperature reaches 160 F.
What goes good with stuffed pork chops? 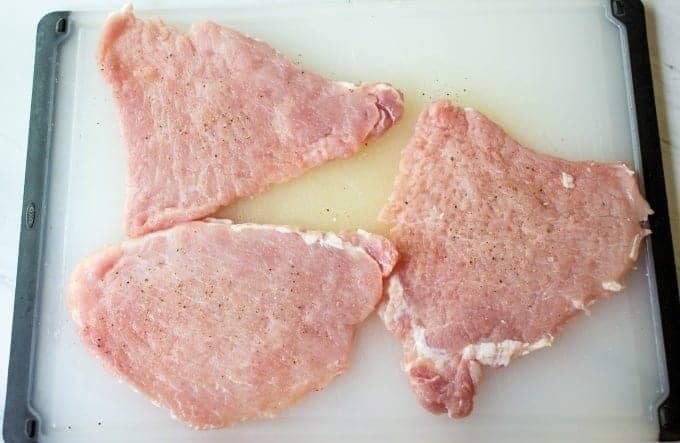 These pork chops already make a quite filling meal and in my opinion the only things that pair well with them are fresh salad, or sauteed veggies. Place a pork chop in between two layers of plastic wrap and using a meat tenderizer or rolling pin, pound the pork chop until it's ¼ inch thick. 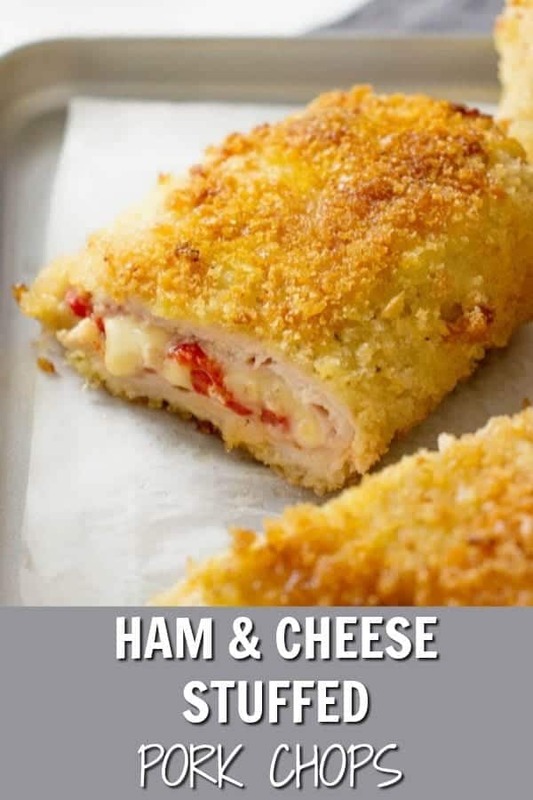 Place one slice of ham on top of each pork cutlet followed by a few thin slices of cheese. Place a slice of roasted bell pepper on top of cheese. 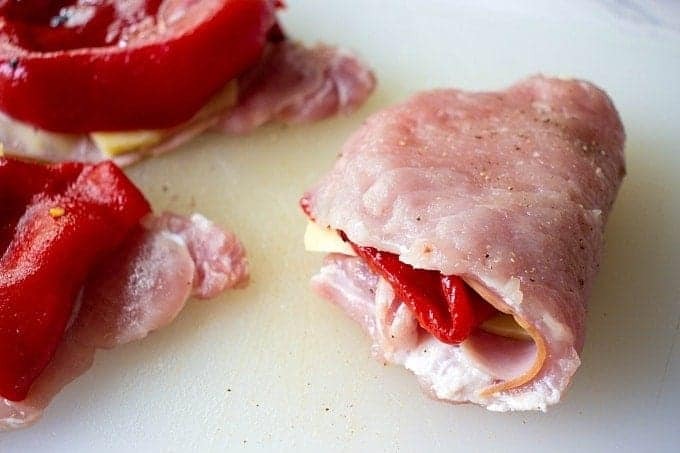 Carefully fold the cutlets in half, enclosing the filling. Secure the exposed part with the toothpicks. Whisk 2 eggs in one shallow bowl. In another bowl add ½ cup of flour and in a 3rd bowl add 2 cups of Panko breadcrumbs. Heat olive oil in a large skillet and over medium heat. Sear stuffed pork chops on each side for 5-6 minutes until crispy and brown. You might need to work in batches. Transfer pork chops on a parchment lined baking dish and bake for 25 minutes or until the internal temperature reaches 160 F.
Serve with a side salad or sautéed vegetables. If you make these Spanish Baked Pork Chops, make sure to snap a picture and post it on Instagram with a hashtag #lavenderandmacarons. Stuffed pork chops sound delicious. This is something that my husband would love! Oh the coating on these! So delicious! Oh and the stuffing! Phew, its all delicious! These look amazing! Like a little pork chop hand pie! Crispy and stuffed?? These pork chops look amazing! I have been wanting to make these kind of chops after my recent trip to Spain. I must say loved the peppers and the crunchy topping. Sounds pretty staightforward to try and cook it at home. Thank you Sunrita! It’s definitely not a complicated recipe to make at home.